Sociologist Seymour Martin Lipset once remarked that, after the Revolution, there were and never have been any true “conservatives” in America. This view, which seems preposterous to modern readers, makes sense if one considers the 18th century context of the term “conservative” as a proponent of monarchy. Therefore, in 1783, the only Americans deserving the term “conservatives” (monarchists) were the Loyalists, and they were in the process of democratizing their viewpoints or packing their suitcases. Already, many Loyalists had fled the new nation, never to return. When war broke out, Tories joined the British military as militiamen, spies, saboteurs, counterfeiters, and even regular soldiers, in sizeable numbers. Cape Fear, North Carolina, fell in no small part due to the presence of Tories. A few had emerged as influential Loyalist leaders, including Joseph Galloway of Philadelphia, David Fanning of North Carolina, and South Carolinian Thomas Brown. “Lynching” originated when Patriot Colonel Charles Lynch of Virginia institutionalized the practice to quell the effects of such men. Their actions enraged and embittered American patriots, who craved revenge against those “coward [ly] servile, slavish, self-interested” traitors. 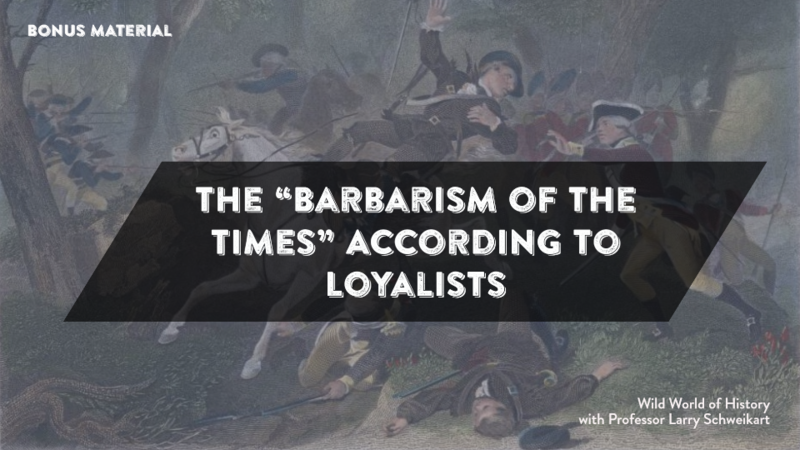 When the revolutionaries finally gained the upper hand, the Loyalists bore the brunt of their hatred and animosity. Ostracized from society, prohibited from practicing their trades, disarmed, and even confined to their homes, Tories paid a heavy price for their political views (though hardly more than the signers of the Declaration had paid for theirs). Tories who refused to sign “loyalty oaths” were tarred and feathered, dunked in nearby lakes, hoisted on Liberty poles, or drafted into the Continental Army. But the most severe punishment was the denial of the most fundamental of all “rights of Englishmen,” property rights. Rebel governments did not permit Tories to vote or hold office. Colonies denied a free press to the Tories, and confiscated their land and possessions, which were never returned. Unfortunately for the Loyalists such as Inglis, they chose the losing side. Their cause was doomed from the beginning because—based on their status quo world view—they were unprepared to fight. The end of the Revolution spelled disaster for the Loyalists, of whom some 8,000 left to join their brethren in Britain or Canada. To this day, Nova Scotia and New Brunswick are populated with the descendants of these American refugees. Some estimates place the exodus at 80,000, many of whom simply crossed the border, where they played a prominent role in Anglicizing French Canada. (The conditions of their arrival also explains the persistence of anti-Americanism to the present from people who ostensibly are “just like us.” In fact, however, from the 1780s on, Canadian opinions of the United States have been negatively shaped by this large, disaffected group of former Americans). This diaspora of Loyalists, however much under duress, represents the only time in American history where, on a large scale, more people left this nation than sought to enter it. Wallace Brown, The Good Americans: The Loyalists in the American Revolution (New York: Morrow, 1969).